The electronics manufacturer LG released a new tablet called LG G Pad IV. It comes with solid middle-class hardware including a full-HD display, integrated LTE 4G, and Android 7.0 Nougat. It’ll be released in South Korea starting at just over 300 US Dollars. 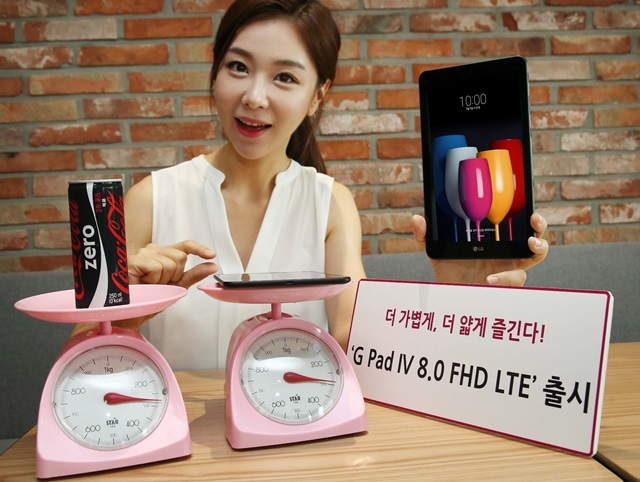 According to LG, the new G Pad IV is as light as a can of Coca-Cola. It weighs 290 gram and is 6.9 millimeters thin. That’s pretty good for its price but the iPad Mini does weigh only 8.8 gram more. The Galaxy Tab S2 is a lot thinner at 5.6 millimeters. Both are more expensive though. The internal hardware of the LG G Pad IV is not too impressive but considering the price it’s not bad either. We’re getting a Qualcomm Snapdragon 435 octa-core chip that’s clocked at 1.4GHz. It has 2GB of memory and a 32GB internal storage. The 8-inch display has a full-HD resolution at 1920 x 1200. We’re getting two 5-megapixel cameras, integrated LTE with a Nano-SIM and a card slot for a microSD-card. Other features include GPS, Bluetooth and WiFi 802.11 a/b/g/n/ac. The battery has a capacity of 3000mAh. It’s the first tablet from LG shipping directly with Android 7.0 Nougat. We don’t know yet if and when the LG G Pad IV will be available outside of South Korea. In its home country, it’ll go on sale today starting at just over 300 US Dollars at a local telecom carrier. I quite liked the first generation of the LG G Pad but starting with the G Pad 2 they got kind of boring. Sales didn’t seem to be great because recent generations haven’t made it to any market inside the European Union. If you’re living outside of South Korea and are looking for something similar the ASUS ZenPad 3 8.0 might be a good alternative for you. It has an 8-inch display as well, good middle-class hardware and integrated LTE. Read the official announcement in Korean here.